Adds 1.5'' overall width to AX10, SCX10, TLT-1, XC or CC-01, Losi Mini Rock Crawler (note: On the losi mini the drive pin is smaller than the slot in the adapter so there will be some slop and the wheels center hole must be opened to 5mm from the stock 4mm) and all vehicles that use 2.2'' Tamiya wheel adaptors. CNC machined out of aluminum. Kit includes 4 wideners, 4 long reach nuts and spring washers. M5 spring washer x 4 Widener is fit on 5mm center hole wheels. If your wheel center hole is 4mm wide it must be widened to 5mm. Works just right with the perfect width still can manage. 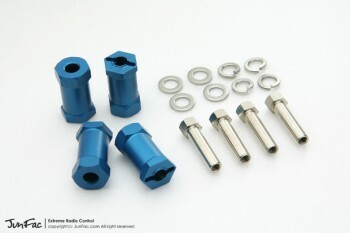 I have used this red set or the blue set of Junfac 2.2 Wheel Wideners on every rc customization that I have done. they are easy to install and come with all the hardware you need.